The Dodgers treated The Kid with kid gloves when he went on the DL, and it's hard to argue with the results: seven innings, zero runs, nine strikeouts. 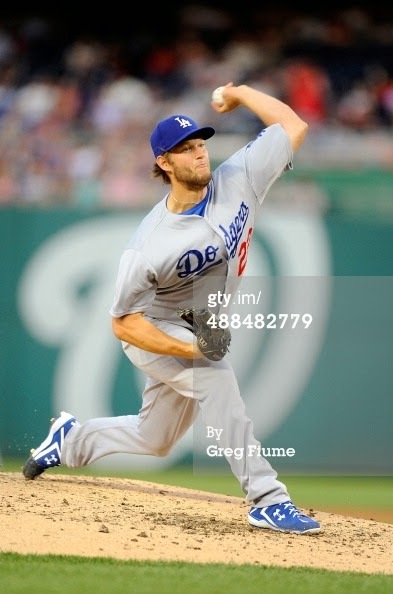 Kershaw threw only 89 pitches, 68 of them for strikes. He also picked off Anthony Rendon in the sixth inning, which proved crucial because Werth and LaRoche followed with singles. Naturally, Kershaw struck out Hairston and Desmond to escape the jam. The Dodgers got the party rolling in their half of the sixth by loading the bases without hitting a ball out of the infield. Hanley, Ethier and Uribe each collected an RBI and the Dodgers led 3-0. Then they broke out the fireworks starting with a seventh-inning triple by Dee (he later scored on an error). Hanley made an error in the top of the eighth but atoned with a homer in the bottom of the inning. Then Butera, of all people, jacked a three-run blast. Perez coughed up three but Kenley pitched a scoreless ninth with a five-run lead. Kershaw's back! We win the West. Just saw that the Giants lost on MLB's first walk-off review. Yay, instant replay!